A new life . . ."
Absolutely beautiful. The balance and attention to detail and movement really draw you in. You're very welcome. I had a look through your gallery and I absolutely love the wide variety of multicultural and spiritual inspirations you seem to draw upon and blend so seamlessly. It's very refreshing in a world of so much 'commercial' art. I look forward to seeing more of your pieces. Wow. The detail and colors are amazing. Lovely work. This is a very personal piece to me, and its resonance to you does bring me joy. This, for some reason, reminds me of YinYang. Very peaceful... Nice work! ?how do you have the time? *jealous* !Powerful art you! Actually I'm not so sure how I balance my time . . . less sleep? This is awesome! Great idea with the koi (each distinctive, particularly in the face) separated by a labyrinth. I've wanted to make a metallic gel-pen on black paper for a long while. You're quite welcome, and my apologies for the late response. You certainly had me fooled, as I could have sworn this was done in metalic gel pens! I got some about a decade ago, still have them. Pentel carries them, among other brands, they sell them online if you're interested. Cool! I'll have to look those up. No worries here. Good to know! You never can tell for certain. I must have this tattooed on my body... this is awesome! I'll post a picture when I get it done. WOW!!! This is incredible work! How long did it take you to draw this?? Just a few hours? Wow! You are really quite talented! Love it , Mazes and motion~! You created a wonderful image here my friend! That must be confusing than ... your mind is very awesome! This is especially beautiful - I really like all of the colors in each scale of the fish. This is really beautiful....strong resonance for me...awakening, yes. My thanks to you Lakan, for your works and for your kind words. oh i love this one . i think it must be my favorite one you have done yet. the idea of a labyrinth haunts me. it seems apt that we are fish caught up in a pattern grater then ourselves that we will never fully understand. 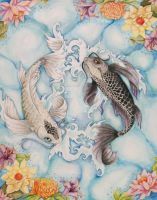 the detail on the two koi is fantastic . I am glad that my work's intent has resonated to you. I would also like to add that there is a dual meaning to this, as it was an actually event that inspired this work.